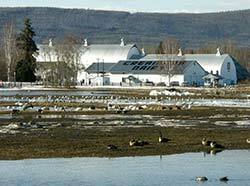 Waterfowl flock to these farmlands. Photo by Barbara Logan. Duck, goose, and crane foraging for food. Photo by Barbara Logan. 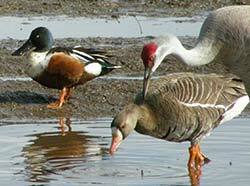 Creamer's Field Migratory Waterfowl Refuge offers year-round birding and wildlife viewing. The mosaic of open fields, forest and bogs is surrounded by the town of Fairbanks. Originally a dairy farm founded in the early 1900s, the Alaska Department of Fish and Game began management of the area in 1968. A three-mile-long network of nature trails crosses the 2,000-acre refuge, passing through boreal forest, seasonal wetlands and open fields. Observation platforms and an elevated viewing tower are great places to stop and scan for wildlife. Self-guided tour booklets and interpretive signs offer viewing tips, natural history facts and describe features on the refuge. More than 150 different birds, both resident and seasonal, have been seen on the refuge. About 60 species can be found here in the summer. In late August, refuge supporters sponsor the annual Tanana Valley Sandhill Crane Festival, a week-long series of events highlighting the visitation of thousands of migrating cranes to Creamer's Fields. About 30 mammal species including moose, fox, coyotes, hares and lynx share these fields and woodlands. Lynx are elusive and generally nocturnal, but in winter their round, oversize tracks in the snow reveal their presence as they hunt their main prey, snowshoe hares. Foxes are common, stalking birds, mice and voles throughout the refuge. Beaver, muskrat and mink can be found around wet areas, and porcupine, ermine, marten and weasels favor the woodlands. Woodchucks dig their underground dens in the refuge and may be seen throughout the spring and summer. These chubby, 5-to-10-pound marmots, which hibernate through the long winter, are also known as groundhogs — the fabled predictors of spring. This area represents the northern limit of their range. An evening walk might provide a glimpse of the secretive northern flying squirrel. Birds and mammals aren't the only creatures at Creamer's; an amphibian is found here as well. In May, a chorus of duck-like quacks can be heard in ponds and marshy areas — these are not ducks, but wood frogs, the only species of frog in Interior Alaska. In May, arctic grayling can occasionally be seen in Jussila Creek near the visitor center. The Farmhouse Visitor Center offers exhibits and information on wildlife viewing, the refuge and its history. During summer, volunteer naturalists lead guided walks on the refuge. Check at the Farmhouse Visitor Center or call 459-7307 for topics, times, and location. Information on Creamer's Field can be found at the Creamer's Field Area Overview. The Friends of Creamer's Field (452-5162) assists with programs and other visitor services on the refuge. For more information visit the Friends of Creamer's Field website.